Even when Gerard Dillon is absent from his own paintings, there is still a blue moon, a lonesome Pierrot, misty essence of the man. That’s the Belfast painter in the sky, illuminating the Connemara Lovers who recline under the expanse of indigo, unaware of that looming feature with the lost smile. In the later paintings like Brothers, the carnival is emphatically over and the fraternal bones hold no comfort for the survivor with his head on the soil. Everywhere, you feel the singular ache of the man. The centenary Gerard Dillon exhibition at the Ulster Museum is subtitled Painter, Dreamer, Clown but there is little comic respite. In the early work, the red bricks and the mills and the windows have limited charm. The Confessional is a tough ritual and the mother prevails. There’s a growing looseness during his time in north London – movement and music and the intrigue of Self Contained Flat with the demure figure on the bed. The painting method suggests Gauguin but the guy in the foreground is Irish, exiled but not quite away from it. There is proper escape after his first visit to Connemara in 1939. The landscapes turn vivid and the participants are all vim and connection. 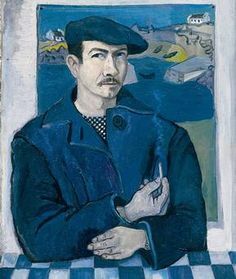 The city boy finds bliss in Inishlacken and there is humour in that Self Portrait with the cigarette and the checked shirt – Van Gough and a sly vogue. Evidently Gerard Dillon was gay, but his time was relatively soon after the demolished reputations of Oscar Wilde and Roger Casement. He did not flaunt it, but the art was truth enough.